If you wear specialty contact lenses, the normal techniques that work for soft and even rigid gas permeable lens wearers don't really work for you. I've put together some tips from across the internet and the expert lens fitters on the topic to help you out if you are having trouble at home after leaving your doctor's office. Synergeyes are hybrid contact lenses that fuse a rigid contact lens center with a soft contact lens "skirt" that provides additional comfort and a "soft lens" feel. Traditionally, inserting and removing these lenses was nothing like what you were used to as a soft lens wearer. With the new changes to the products, certain Synergeyes lenses can now be applied much more like a regular soft lens. You can insert the lens straight onto the eye, just like a soft contact lens with the new guidelines for the product. Because the lens is larger, it is easiest to hold it with a two or three finger "tripod" approach as you insert the lens for balance. Filling the lens with solution before insertion is not required. Since you are filling the bowl of the lens completely and don't want to loose all of that solution before getting the lens on your eye, you may prefer using a tool to aid in insertion like the DMV inserter (should be able to get this from your doctor's office) or EZI Lens Applicator for extra balance versus using the finger balance approach. Make sure the DMV has a hole in the bottom to prevent the inserter from suctioning to your contact lens. the EZI lens applicator in a variety of specialty lens sizes here. To prevent spillage, you will need to insert the lens by keeping it parallel to the counter top surface so that you don't tip all of the fill solution out. You can either bend over at the waist or tuck your chin into your chest to achieve the right position. The key is having your contact lens and your face horizontal for the entire process. Putting a small mirror on your counter may help with seeing what you are doing for this method. Do not press too hard! The soft lens skirt can flex and almost turn inside out with too much force, causing all that liquid to escape out the sides and creating excessive suction between your eye and the lens (thus reducing comfort). Shoving the lens into your eye will really reduce your end of day comfort. Bubbles are always an insertion error with this lens, so if you have a bubble, remove the lens, refill, and reinsert. These lenses are much larger than traditional contact lenses, typically between 15 to 20 mm in diameter. The only way to get all day comfort with a scleral lens is to fill the bowl completely with solution, and insert it as described above with the Synergeyes UltraHealth method. Use a DMV inserter (with a hole in the bottom to prevent suction!) or the EZI applicator to balance the lens, or you can use the tripod three finger approach if easier. Insert the lens by tucking your chin into your chest so that you are parallel with your counter surface and insert the lens directly onto the eye to prevent spillage. If you experience a bubble, remove the lens, refill, and reinsert. Make sure that when you are inserting the lens, you need to let your eyelids go before you remove the inserter or your finger from the lens. Your eyelids will hold the lens in place on your eye. If you remove the inserter before you let your eyelids go, then the lens is likely to fall out. Filling your contact lens with the right solution is essential to all day comfort and clarity. Many specialty lens wearers will experience end of day dryness, redness, or lens fogging. The right filling solution can solve all of these problems! Unisol 4 Sterile Saline: This saline is OTC and can be found at any local pharmacy or drug store on the contact lens or eye drop aisle. It is just simple saline, so this is NOT a good solution for cleaning a lens, but it is great for rinsing before insertion and for many people will suffice for their filling solution if they don't have sensitive eyes. Preservative Free Artificial Tears: If you have sensitive eyes (eye drops or your contact lenses typically burn when you first use them), then you want a preservative free filling solution. Preservative free Systane Ultra or Refresh Optive artificial tears are thin and clear, making them ideal for use with contact lens wear. In the past, the Synergeyes company often recommended filling with Refresh Celluvisc, but this is a very thick solution and can cause blurry vision. 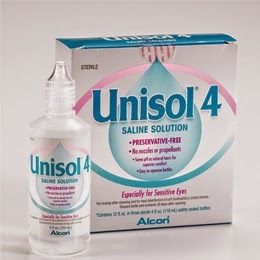 Unisol 4 is also available in preservative free vials for added comfort. 0.9% NaCl inhalation vials: This is an off-label use of the saline solution, but my favorite option for filling your contact lenses. It is both preservative free and buffer free, making it the least toxic solution that you can have against your eye all day. For scleral lens wearers this solution can not only vastly improve comfort, but can also improve clarity as you go through the day. Preservatives and buffers can disrupt your corneal cells and tear film, causing fogginess and variable vision. If you are having trouble with your lenses, definitely order these vials off of Amazon. The take home is do not fill your lenses with contact lens cleaning solution. This is a common error I see patients making because you have contact lens solution around the house already, and buying another product is another expense. Using contact lens solution to fill your lenses will cause irritation, redness, and vision disruption, overall reducing your contact lens performance. The reason it won't work? Contact lens solutions like Opti-Free and Biotrue are made to clean your lenses -- they have chemical components to kill bacteria and eat away deposits. These chemical compounds are also really toxic to your corneal surface when trapped against your eye all day, so skip the contact lens solutions and get the saline products that will keep your eyes healthy and comfortable.